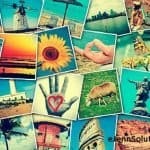 Home » LinkedIn Profiles: Are You Using Custom Backgrounds? Earlier this year, LinkedIn premium accounts received the privilege of creating a customized background image on their LinkedIn Profiles. You may have noticed this on some profiles as you clicked your way through LinkedIn. Logging into your personal LinkedIn Profile, you’ll probably see the same type of image you see above. The option (and size needed) to upload a custom photo. Choose an image that fits your personal brand. The size should be 1400 x 425 for best results. Make sure the image is a high quality image … nothing is worse than a blurry photo on a professional profile. For my background photo, I’m starting to write a book titled “Positive Moves to the beach” … with that – my background photo reflects the beach. eJenn Solutions also brings calm to the social media landscape for our clients … this photo reflects that. Need some ideas regarding what you can use for you branding custom background photo? Own your own business? How great it would be to upload your business’s team photo! How about uploading a photo of your office building? The key to your photo ideas … keep it related to your brand and keep it professional!